I am on the one track mind express to knitting town at the moment. 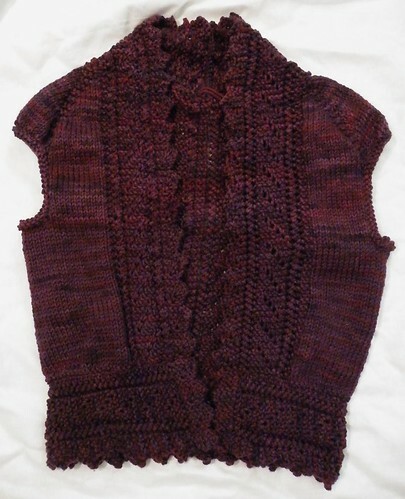 A couple weeks ago I kinda challenged myself to knit five sweaters in two months – from the beginning of July to the end of August, mostly because there’s a number of cropped or short-sleeved sweaters I want to knit right now and it would be nice to finish them before it gets too cold to wear them. And I started on Goodale, which I highly recommend if you enjoy endless rows of stockinette. Tuesday night I finished the yoke and separated the sleeves. If all goes to plan I should have this baby finished by next Wednesday so I can start my next project, which I think is going to be Abalone. 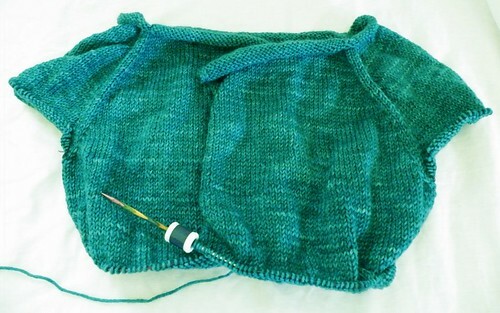 I want to have it finished by the time I leave for vacation on August 10th. I’m heading to Santa Fe. You & Jodi are cracking me up on Twitter! Love the color of your Watershed. I recently got back in the knitting groove myself after a time of low knitting mojo…feels good! Can’t imagine anyone could beat you once you have set your mind to something – take that as a warning Jodi! Most of all you are making some beautiful sweaters. Can’t wait to see Watershed on you! i joined the knit a sweater a month group in ravelry, so far i’ve completed only 2 1/2 …..
wish i can be like you and Jodi…looking forward to see your FOs. Hi! I love your collection of short-sleeved cardigans, and was wondering if you have any tips on searching for patterns like them on Ravelry. Thanks for these beautiful little inspirations! Ohh I can’t wait to see Watershed blocked! I’m loving the color and the lace front panels. You are rocking out this challenge so far! Wow! You’re my hero 😉 I have no time to knit in the summer but still find time to comment on blogs. Go figure! Go go go! You can win the contest! I’ll be back to see the other sweaters. So far, they are beautiful! I look forward to seeing them modeled!